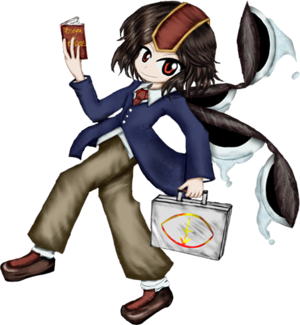 Hibaru Kokutenshi (旭天子　ヒバル, Kokutenshi Hibaru) is a skylark-youkai that works for Gappori, a financing company, as a debt collector. They are very good at their job, but they are a bird-brain and bad at pressuring people for money. They are the stage 4 boss of Earthen Miraculous Sword, the second game of the Len'en Project. Years ago, when there was sun in Mugenri, Hibaru lent the sun some money. Day by day, the loan accumulated interest, swelling to huge proportions, but before Hibaru realized it the sun had disappeared from Mugenri. Hibaru has never forgotten the loan, and in order to collect the debt, they fly high up into the sky everyday, chirping towards the sun. A bird working as a debt collector, Hibaru is very professional at their job, but surprisingly, they're bad at lying and pressuring people. Perhaps due to living for a long time, Hibaru is rather old-fashioned. Also, it seems Hibaru is hated for their job and is considered to be a "rotten executive". Their character may be a homage to Aya Shameimaru . Both are stage 4 bosses who are bird youkai that are quite old and devoted to their job, but are also quite silly. Their full name is Hibaru Kokutenshi (旭天子　ヒバル). Their given name Hibaru (ヒバル) means a "lark" or "skylark" (雲雀, Hibari, two types of birds), written in katakana. Their family name Kokutenshi (旭天子) literally means "morning sun emperor". It may be derived from koutenshi (告天子), an alternative word for skylark. According to JynX, "Hibaru" is written as "雲雀流 (simplified: 云雀流)" in Chinese. 雲雀 is Chinese for the "eurasian skylark", while 流 means "river", "class (status-wise)" or "to flow". Hibaru has neck-length brown hair and light brown eyes. They're dressed as a typical salaryperson, wearing a white dress shirt with a red tie, a navy suit jacket, beige pants, and brown loafers. Their wings have patterns of four eyes of the sacred beasts. In Earthen Miraculous Sword, Hibaru tries to advertise their company to the heroes and offers some loans, but they're rejected. They try to pressure them by challenging them, but they are defeated. In Kuroji Shitodo's scenario, Kuroji steals all of Hibaru's money. Hibaru mentions having a connection to Senri Shrine and Tsurubami. While the details of this relationship are unknown, Tenkai says they once attempted to kill Tsurubami. Hibaru and Tsugumi knew each other in the past, possibly due to both of them having a connection to Senri Shrine. Tsugumi says Hibaru once tricked them and left them for dead. According to JynX, the Eyes of the Four Sacred Beasts each house the power of one of the beasts each. This page was last edited on 19 March 2019, at 04:37.